The Mississippi River basin contains the largest and most intensively farmed region in the Nation. In order to increase yields from crops, large amounts of pesticides are used to protect against weeds, insects, and other pests. The major categories of pesticides are herbicides, insecticides, and fungicides. It is estimated that about two-thirds of all pesticides used for agriculture in the United States are applied to cropland and pasture land in the Mississippi River Basin (Gianessi and Puffer, 1990). The intense use of pesticides is of concern because of potential adverse effects on the quality and use of water resources. The most immediate concerns are for aquatic life and for the 18 million people in the basin who rely on surface-water sources for drinking water. Figure 37. -- An estimated 5.5 million metric tons of nitrogen fertilizer were applied to croplands in the Mississippi River Basin during 1991. This map was prepared by W.A. 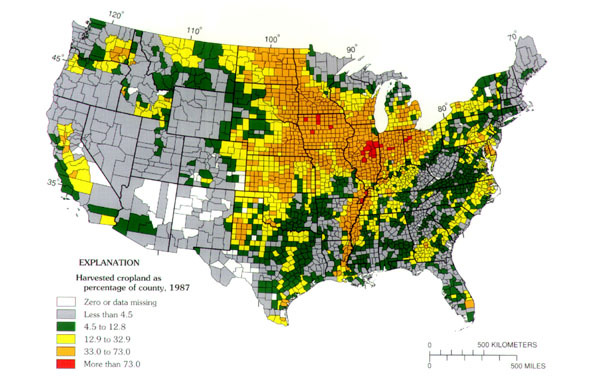 Battaglin of the U.S. Geological Survey to show the geographical distribution of the estimated use of nitrogen fertilizer in the Nation during 1991. County estimates were made by J.J. Fletcher of West Virginia University, using fertilizer expense estimates from the 1987 Census of Agriculture. State totals were compiled by the National Fertilizer and Environmental Research Center of the Tennessee Valley Authority. Agricultural lands of the Corn-Belt States of Iowa, Illinois, Indiana, and Minnesota clearly are potential sources of nutrients in the Mississippi River. Figure 38. -- Cropland in the United States is concentrated most heavily in the areas drained by the Mississippi River. In this map, prepared by W.A. Battaglin of the U.S. Geological Survey from data supplied by the U.S. Department of Commerce, Bureau of the Census, Census of Agriculture, harvested cropland is expressed as a percentage of the total area of each county. The Mississippi River Basin contains about 65 percent of the total harvested cropland in the Nation, producing about 80 percent of the corn and soybeans, and much of the cotton, rice, sorghum, and wheat (U.S. Department of Agriculture, 1985; U.S. Department of Commerce, 1989). Many of the pesticides used in the basin are present in the Mississippi River and its tributaries. A regional-scale study of a 10-State area in the upper Midwest showed that large amounts of herbicides are flushed into streams during storm runoff in late spring and summer each year, following application of herbicides to cropland (Thurman and others, 1992). Storm runoff produces high concentrations of many herbicides in streams across the upper Midwest from Nebraska to Ohio for periods of several weeks to several months. Concentration of herbicides in some small streams may exceed 100 micrograms per liter (µg/L) for short periods of time. Flow from these streams, in turn, transports significant amounts of herbicides into large rivers such as the Missouri, Ohio, and Mississippi, and eventually to the Gulf of Mexico (Pereira and Rostad, 1990; Goolsby and others, 1991; Pereira and Hostettler, 1993). Pesticides include a wide variety of synthetic organic and inorganic compounds used to control weeds, insects, nematodes and other pests. The U.S. Environmental Protection Agency (Aspelin and others, 1992) estimated that in 1991 about 490 million kilograms (kg) of pesticides were used annually in the United States. These include herbicides (285 million kg), insecticides (113 million kg), and fungicides (54 million kg). About three-fourths of the total annual pesticide use is for agriculture (Aspelin and others, 1992). In 1991, about 218 million kg of pesticides were used on major field crops alone, of which about 84 percent were herbicides (U.S. Department of Agriculture, 1992). Pesticides derived from point and nonpoint sources in the Mississippi River basin are transported into the Mississippi River in runoff from agricultural and urban areas, discharge from reservoirs and aquifers, and atmospheric deposition (Nations and Hallberg, 1992). The physiochemical properties of the pesticides themselves, as well as other factors such as usage, rainfall, and farming practices, are important in governing the amounts and concentrations that actually occur in streams. Several important physiochemical properties of the most widely used pesticides in the Mississippi River basin are given in table 8. These include water solubility, soil half-life, and soil sorption coefficient (Koc). Water solubility determines how easily pesticides wash off soil and crop residues and how easily they leach through the soil. Pesticides with solubilities greater than about 30 milligrams per liter (mg/L) are considered to be soluble and more likely to wash off the soil during storms. Soil half-life is the length of time required for pesticides to degrade in the soil to one-half their previous concentration. The longer the soil half-life the more persistent the pesticide, and the longer it will be available to wash off in storm runoff. The half-life of pesticides, once they are in surface water, is generally much longer than in soil because water contains much less organic matter and fewer micro-organisms to degrade the pesticides. Many pesticides are highly persistent in streamwater and in reservoirs, but very little specific information is available on pesticide half-lives in natural water bodies. The soil sorption coefficient is a measure of the tendency of a pesticide to attach to soil particles. The larger the Koc value the more strongly the pesticide will be adsorbed to soil. Those with Koc values less than about 500 tend to be transported primarily in the dissolved phase. Those with Koc values of more than 1000 are transported primarily on suspended-sediment particles. Figure 39. -- Most of the pesticides used in the Mississippi River Basin are herbicides used for weed control. Data portrayed in this figure, representing the years 1987--89, were obtained from Resources for the Future (Gianessi and Puffer, 1990). 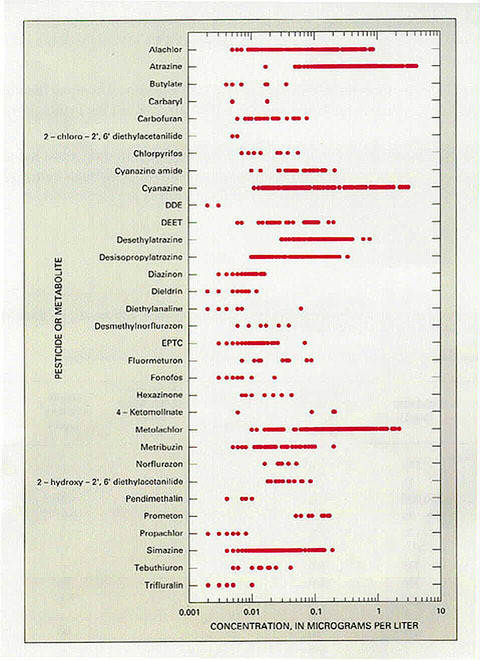 The 20 most heavily used herbicides are shown in this graph. The most heavily applied herbicides are atrazine, alachlor, and metolachlor, which are used in the production of corn and soybeans. Atrazine is used most heavily in the upper Midwest, generally to control broad-leaved weeds in cornfields. Other herbicides used extensively on corn and soybean fields have geographical patterns of use similar to that of atrazine, but the amounts are somewhat less. The physiochemical properties listed in table 8 indicate that relatively soluble and mobile compounds such as atrazine, alachlor, metolachlor, and many other herbicides are transported primarily in the dissolved phase. This group of compounds includes the majority of pesticides in use today. However, soil half-life and other factors such as intensity of use, application methods, and climatic conditions are also important in determining transport in surface water. Most of the older "first generation" chlorinated insecticides, such as DDT, chlordane, and dieldrin (not shown in table 8), are insoluble in water, have long soil half-lives, and large Koc values. Consequently, they are transported primarily on sediment particles. Most of these first-generation chlorinated insecticides are banned and are no longer used in the United States, but continue to persist in the Mississippi River Basin from previous use because of long soil half-lives. Also, because these chlorinated insecticides are relatively insoluble in water and have large Koc values, they partition into the organic coatings of sediments or accumulate in the fatty tissues of fish and other stream biota (Moore and Ramamoorthy, 1984), which is not true for most pesticides currently in use. Figure 40. -- The concentrations of 32 pesticides and pesticide-degradation products dissolved in waters collected from the main-stem Mississippi River during 1987--92 are shown here in dot plots. These plots show the distribution and range in concentration for each pesticide. Each dot represents one sample. The dot plots summarize a diverse body of data that represents concentrations during different seasons of the year at numerous locations. 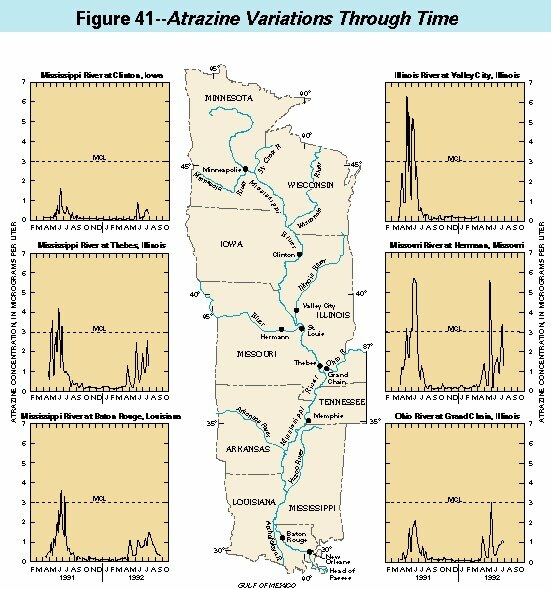 The samples on which the plots are based were collected (1) during 10 downriver sampling trips between July 1987 and May 1992 and (2) approximately weekly at 3 fixed stations on the Mississippi River (Clinton, Iowa; Thebes, Illinois; Baton Rouge, Louisiana) from April 1991 through September 1992. The concentrations of pesticides measured near the mouths of tributaries that flow into the Mississippi River generally are slightly higher than those shown in this figure. Specific sampling locations and analytical data are given by Coupe and others (1995) and Pereira and others (1995). The maximum contaminant levels (MCLs), or drinking-water standards, that have been established by the U.S. Environmental Protection Agency (1995) for several pesticides also are shown in table 8. MCLs are based on annual average concentrations and are legally enforceable under the Safe Drinking Water Act. MCLs are based on analyses of a minimum of four samples per year, and a violation occurs only if the average concentration in these samples exceeds the MCL. Further, MCLs apply to water delivered at the tap and not the raw water source. However, conventional water treatment removes very little of the water-soluble pesticides currently used in the Mississippi River Basin. At present (1995) MCLs are established only for individual compounds and do not consider the possible effects of complex mixtures of pesticides and their degradation products. Health advisories (HAs) have been established for many other pesticides (table 8). HAs are the recommended maximum concentrations in drinking water for lifetime exposure and are not legally enforceable. However, in time, the lifetime HAs for many pesticides may become enforceable MCLs. Many pesticides may have adverse effects on aquatic life, but at present (1995), the U.S. Environmental Protection Agency has established standards or criteria for aquatic life for very few current-generation pesticides. However, Environment Canada has established water-quality guidelines for specific water uses in Canada that include drinking water, aquatic life, and agricultural uses of water (Wong and Kent, 1988). The guidelines are numerical concentrations recommended to support and maintain a designated water use. Because U.S. guidelines or criteria for aquatic life do not presently exist for most pesticides in current use, the Canadian pesticide water-quality guidelines, where available, have been included in table 8 as points of reference for pesticide concentrations measured in the Mississippi River Basin. More than 40 pesticides and pesticide degradation products were detected during 1987--92 in water samples collected from the Mississippi River or from the mouths of large rivers that flow directly into the Mississippi (Goolsby and Battaglin, 1993). Thirty-two pesticides and pesticide degradation products that were detected in 5 percent or more of the nearly 600 water samples collected during the study period are shown in figure 40. The pesticides detected most frequently and in highest concentrations were the most extensively used compounds with low Koc values such as atrazine, alachlor, metolachlor, and cyanazine. In contrast, several other extensively used compounds such as butylate, EPTC, and trifluralin (fig. 39A) were detected infrequently and in low concentrations. The most persistent compounds were alachlor, atrazine, cyanazine, desethylatrazine (an atrazine degradation product), metolachlor, and simazine, all of which are herbicides. These herbicides were detected in low concentrations in more than 75 percent of the samples analyzed. Two herbicides, atrazine and metolachlor, were detected in more than 95 percent of the samples. Although numerous pesticides were detected in many samples, only three compounds, atrazine, alachlor, and cyanazine, exceeded MCLs or HAs in only a small percentage of samples. The average annual concentrations were far below MCLs or HAs. Atrazine and cyanazine concentrations in a few samples also exceeded the Canadian aquatic-life guidelines (compare concentrations shown in figure 40 with the guidelines listed in table 8). For a period of several weeks during May through July, atrazine, cyanazine, and to a lesser extent alachlor concentrations in the Mississippi River main stem and in tributaries may exceed MCLs or HAs. However, because the annual average concentrations of these compounds are well below health-based limits, there is no violation of the Safe Drinking Water Act and the water would be considered suitable for public supply from the standpoint of pesticides. Figure 41. -- Pronounced seasonal variations are typical of pesticide concentrations in the Mississippi River and its tributaries. Atrazine, the example portrayed in this figure, is more concentrated during late spring and early summer than during other parts of the year. Concentrations shown here are based on samples collected approximately weekly (more frequently during late spring and early summer, less frequently at other times). Runoff caused by rainstorms following the application of atrazine to cornfields early in the growing season flushes a portion of the atrazine into streams that eventually flow into the Mississippi River. Most other major herbicides show a seasonal pattern of runoff similar to that of atrazine. Data from two growing seasons, 1991 and 1992, are shown here. The differences in concentrations between 1991 and 1992 probably are caused by differences in the intensity and timing of rainfall. Pesticides will be transported in storm runoff as long as their residues remain on the soil or on plant surfaces. As the growing season progresses and wanes, concentrations of pesticides in storm runoff decrease to low levels. For a few weeks of 1991 and 1992, concentrations of atrazine, cyanazine, and (to a lesser extent) alachlor reached or exceeded maximum contaminant levels (MCLs) or health advisories (HAs). However, the average annual concentrations of these compounds were well below these health-based limits. Therefore, these pesticide concentrations did not violate the Safe Drinking Water Act or make the water unsuitable for public supply. The majority of all pesticides used in the Mississippi River Basin are applied in the upper part of the basin. Consequently, streams draining Illinois, Iowa, Indiana, eastern Nebraska, and southern Minnesota contribute the largest quantities of pesticides to the Mississippi River. As water flows downriver from the Minneapolis area, inflow from tributary streams results in large and often dramatic increases in pesticide concentrations during May through July, as illustrated in figure 44. Two major objectives of our Mississippi River study were to determine the predominant source areas for pesticides and to estimate the mass transport of these chemicals from major tributaries into the Mississippi River and to the Gulf of Mexico for a 1-year period. The transport for each pesticide of interest was calculated for each day of the year using either measured or estimated daily pesticide concentrations and mean daily streamflow. Pesticide concentrations were estimated by linear interpolations for days on which no samples were collected. The estimated daily transports were then summed to obtain an estimate of annual transport. Mass-transport estimates were made in this manner for the six sites where approximately weekly samples were collected. The annual mass transport of pesticides to the Gulf of Mexico was estimated from concentrations measured at Baton Rouge, Louisiana, and streamflow at Baton Rouge plus the streamflow diverted from the Mississippi into the Atchafalaya River upstream from Baton Rouge (fig. 45). Loads of 21 major pesticides and degradation products transported by the Mississippi River at four locations and by three major tributaries during a 1-year period (April 1, 1991, through March 31, 1992) are given in table 9. Iowa and Illinois are the predominant sources for most pesticides transported by the Mississippi River. The Upper Mississippi River Basin, excluding the Missouri River Basin, constitutes about 22 percent of the total Mississippi River drainage basin, but contributes about 40 percent of the atrazine, and 50 percent or more of many other pesticides transported by the Mississippi River (table 9). The area receives essentially all of the streamflow discharged from Iowa and Illinois, which contain the most intensive crop-production areas in the basin (fig. 38). These two States apparently also are the sources for much of the agricultural chemicals transported by the Mississippi River. The Ohio River Basin is the source of about one-half the butylate and most of the simazine transported by the Mississippi River (table 9), and the Missouri River Basin is the predominant source for trifluralin. Although the annual mass transport appears to be large for several pesticides (table 9), it represents only a small fraction, generally less than 3 percent, of the pesticide mass applied annually to cropland in the basin. The mass of pesticides discharged from the Mississippi River Basin to the Gulf of Mexico during April 1991 through March 1992 expressed as a percentage of the annual mass applied to cropland was 0.2 percent for alachlor, 0.8 percent for metolachlor, 1.6 percent for atrazine and cyanazine, and 2.7 percent for simazine. A similar fraction of the mass of these pesticides applied in the Illinois, Ohio, and Missouri River Basins was discharged from these rivers. These percentages may be higher or lower in other years, depending on rainfall patterns. Figure 42. -- Temporal variations in the concentrations of herbicides in the Mississippi River reflect two factors: (1) the application of the herbicides on croplands, and (2) the rainfall and runoff events that follow the applications. This figure shows the concentrations of three herbicides measured in the Mississippi River at Baton Rouge, Louisiana, at weekly to biweekly intervals between April 1991 and September 1992. Plotted in the figure is the streamflow at Baton Rouge plus the flow diverted into the Atchafalaya River above Baton Rouge. The heavier rainfalls during the planting and post-planting periods in 1991 resulted in greater streamflows, more flushing of herbicides from the fields, and higher herbicide concentrations than in 1992. Most streams throughout the Midwestern United States contain water with high concentrations of pesticides for several weeks to several months following the application of pesticides to farmlands. Concentrations generally are largest and may briefly exceed health-based limits for drinking water during runoff from the first storms after application. Concentrations decrease during later runoff events. More than 40 pesticides and pesticide degradation products were detected in the Mississippi River. Most of these were at concentrations less than 0.5 µg/L. Maximum concentrations during 1991--92 of the most extensively used herbicides such as alachlor, atrazine, cyanazine, and metolachlor ranged from 3 µg/L to about 6 µg/L in large rivers such as the Mississippi, Missouri, and Ohio, compared to 50 to more than 100 µg/L reported in previous studies of smaller tributaries. These high concentrations generally represent extreme conditions that do not persist past midsummer. The average annual concentrations of all pesticides measured in the Mississippi River are well below health-based limits and do not violate the Safe Drinking Water Act. Low concentrations (0.05 to 0.2 µg/L) of a few pesticides are detectable year-round in the Mississippi River Basin owing to storage and subsequent discharge from surface- and ground-water reservoirs. The total mass of pesticides discharged from the Mississippi River and its major tributaries from April 1991 through March 1992 represents a small fraction (from less than 0.1 to about 3 percent) of the amounts applied. About 40 percent of the atrazine mass and more than 50 percent of the mass of many other heavily used pesticides discharged to the Gulf of Mexico originate in the Upper Mississippi River Basin, above the confluence with the Missouri River. This area constitutes only about 22 percent of the drainage area of the Mississippi River Basin. Varying climatic conditions cause considerable variation in the maximum annual pesticide concentrations and in the annual loads. Wet years with intense rainfall shortly after application of pesticides tend to have the highest pesticide concentrations in streams and the highest loads. Figure 43. 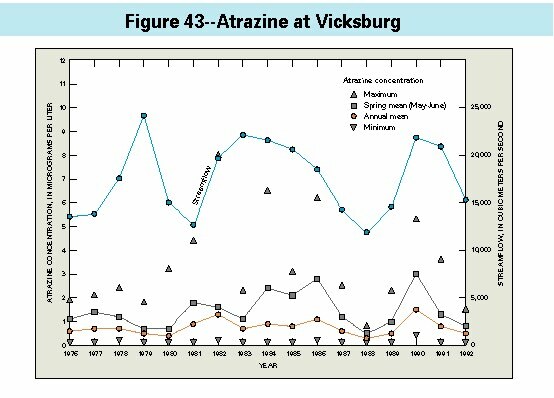 -- Long-term records on atrazine concentrations in the Lower Mississippi River at Vicksburg, Mississippi, are shown in this figure. Concentration data for 1976--90 were collected by Ciba Geigy (the manufacturer of atrazine), its contractors, and other chemical companies, and are based on 11--51 samples per year (Tierney, 1992). Concentration data for 1991--92 are those shown in figures 41 and 42 for the station at Baton Rouge (Coupe and others, 1995). Mean annual streamflows are those measured in the Mississippi River at Vicksburg, Mississippi. The minimum, mean, and maximum values of atrazine concentration show no apparent upward or downward trends during the 17 years portrayed here, but after the mid-1980s the mean and maximum concentrations do tend to parallel the year-to-year increases and decreases of streamflow. Figure 44. 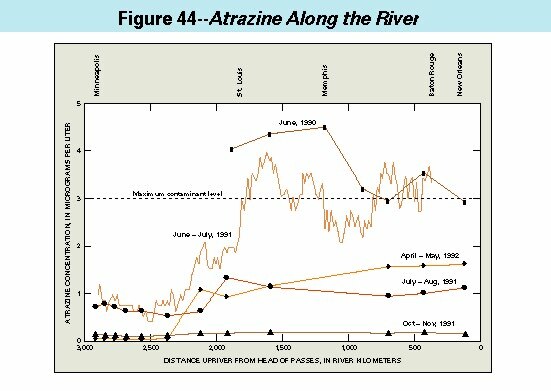 -- Atrazine concentrations in the Mississippi River are consistently low for the first 600 kilometers below Minneapolis, and they increase rapidly downriver as the river collects water from tributaries that drain the Corn Belt. Shown here are measurements of atrazine in waters collected from the Mississippi River during five different sampling trips: the discrete points connected by straight-line segments represent samples collected in downstream sequences; the continuous line labeled June-July 1991 represents samples collected from the river, at 10-mile intervals, in upriver sequence. Highest concentrations were measured during the months immediately following the application of atrazine (June 1990, June-July 1991). Details are best shown in the data of June-July 1991, which represent the most intensive sampling: a doubling of atrazine concentrations between river kilometers 2250 and 2000, where the Rock, Cedar, and Des Moines Rivers deliver pesticides, including atrazine, from northern Iowa and Illinois; another significant increase below river kilometer 1900 as a result of inflows from the Illinois and Missouri Rivers; a decrease near kilometer 1530 where the Mississippi is diluted by inflow from the Ohio River. 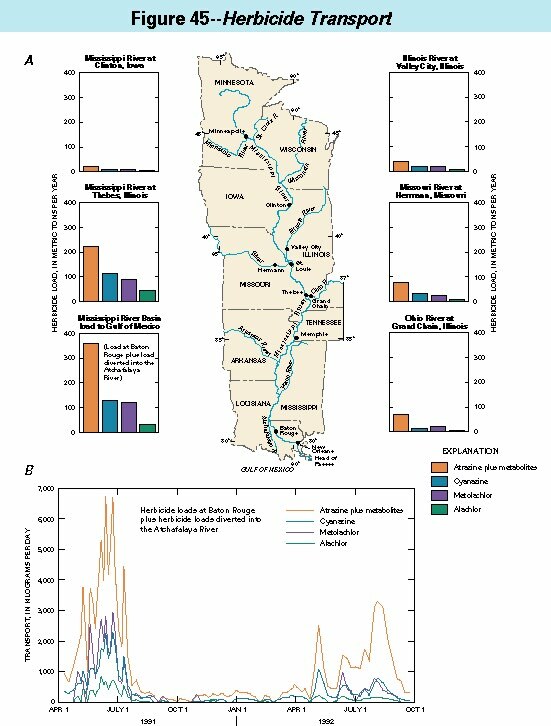 The variability in atrazine concentration between river kilometer 1530 and Baton Rouge probably results from short-term storm runoff pulses entering the Mississippi from the Missouri River and other major tributaries (Moody and Goolsby, 1993). These runoff pulses have high concentrations of pesticides and can produce water masses in the Mississippi River that are interspersed with water containing lower concentrations. This is analogous to turning on a point source of pesticide for a few days and then turning it off. This kind of spatial variability was also observed during another upriver transect (not shown in the figure) made in late May 1990, and to a lesser extent in upriver transects conducted in late September 1991 and late March 1992. Details of procedures for collecting and analyzing the samples and complete listings of the data represented in the figure are given by Goolsby (1995) and Pereira and others (1995). Figure 45. -- The four pesticides (all herbicides) transported in the largest quantities by the Mississippi River are atrazine (plus two of its metabolites, desethylatrazine and desisopropylatrazine), cyanazine, metolachlor, and alachlor. The loads of these four herbicides discharged to the Gulf of Mexico during the 1-year period from April 1, 1991, through March 31, 1992, ranged from 365,700 kg for atrazine and its metabolites to 33,700 kg for alachlor. This was a period of slightly greater than average streamflow, so these figures might represent herbicide transports somewhat greater than average. Most of the herbicides discharged into the Mississippi River originate in the Upper Mississippi, Missouri, and Ohio River Basins. Except for atrazine, there appear to be no significant inputs of most herbicides between the Ohio River confluence and Baton Rouge, a distance of about 1,160 river kilometers. This distance represents a traveltime in the river of about 10 days. The annual alachlor load in this reach decreased from 47,900 kg below the Ohio River confluence to 33,700 kg at Baton Rouge, a decrease of about 30 percent. This decrease is believed to be due primarily to degradation (and, possibly, volatilization) of alachlor in the Mississippi River. Temporal distributions of the rates at which the four major herbicides were transported by the Mississippi River to the Gulf of Mexico have been calculated here from the data on streamflow and concentrations, much of which was shown earlier in figure 42. For complete data, see Coupe and others (1995). Most of the herbicide transport during this period of study occurred during May and June, shortly after herbicide application. Maximum transport rates were about 6,500 kg per day for atrazine and two of its metabolites, about 3,000 kg per day for metolachlor, about 2,000 kg per day for cyanazine, and about 700 kg per day for alachlor. 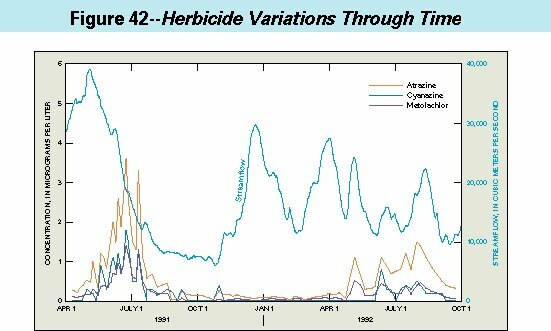 Other herbicides were transported at much lower rates. The rates of transport and total masses of these four herbicides transported were considerably lower in 1992 than in 1991, probably as the result of less intense rainfall and less flushing of herbicides from cropland in 1992. Pesticide industry sales and usage, 1990 and 1991 market estimates: Washington, D.C., U.S. Environmental Protection Agency, 37 p.
Pesticides: Surface runoff, leaching, and exposure concerns: University of Minnesota, Minnesota Extension Service AG-BU-3911, 32 p.
Pesticide, nutrient, water-discharge, and physical-property data for the Mississippi River and some of its tributaries, April 1991-September 1992: U.S. Geological Survey Open-File Report 93-657, 116 p.
Herbicide use in the United States: Resources for the Future, 127 p. [Revised 1991]. Dissolved herbicides, in Moody, J.A., ed., Chemical data for water samples collected during four upriver cruises on the Mississippi River between New Orleans, Louisiana, and Minneapolis, Minnesota, May 1990-April 1992: U.S. Geological Survey Open-File Report 94-523, p. 19--87. Occurrence, distribution and transport of agricultural chemicals in surface waters of the Midwestern United States, in Goolsby, D.A., Boyer, L.L., and Mallard, G.E., eds., Selected papers on agricultural chemicals in water resources of the Midcontinental United States: U.S. Geological Survey Open-File Report 93-418, p. 1--25. Distribution of selected herbicides and nitrate in the Mississippi River and its major tributaries, April through June 1991: U.S. Geological Survey Water-Resources Investigations Report 91-4163, 35 p.
Canadian water quality guidelines for metolachlor: Ottawa, Environment Canada Scientific Series no. 184, 34 p.
Canadian water quality guidelines for trifluralin: Ottawa, Environment Canada Scientific Series no. 190, 92 p.
Spatial variation of triazine herbicide concentrations in the lower Mississippi River: Environmental Science and Technology, v. 27, no.10, p. 2120--2126. Organic chemicals in natural waters---Applied monitoring and impact assessment: New York, Springer-Verlag, 289 p.
Pesticides in Iowa precipitation: Journal of Environmental Quality, v. 21, p. 486--492. Canadian water quality guidelines for metribuzin: Ottawa, Environment Canada Scientific Series no. 179, 44 p.
Canadian water quality guidelines for cyanazine: Ottawa, Environment Canada Scientific Series no. 180, 26 p.
Canadian water quality guidelines for simazine: Ottawa, Environment Canada Scientific Series no. 187, 29 p.
Nonpoint source contamination of the Mississippi River and its tributaries by herbicides: Environmental Science and Technology, v. 27, no. 8, p. 1542--1552. Concentrations and mass transport of pesticides and organic contaminants in the Mississippi River and some of its tributaries, 1987--89 and 1991--92: U.S. Geological Survey Open-File Report 94-376, 169 p.
Occurrence, distribution, and transport of herbicides and their degradation products in the lower Mississippi River and its tributaries: Environmental Science and Technology, v. 24, p. 1400--1406. Canadian Water Quality Guidelines, Chapter 3, Freshwater aquatic life: Ottawa, Environment Canada, chap. 3, p. 36. A reconnaissance study of herbicides and their metabolites in surface water of the Midwestern United States using immunoassay and gas chromatography/mass spectrometry: Environmental Science and Technology, v. 26, no. 12, p. 2440--2447. A review of historical surface water monitoring for atrazine in the Mississippi, Missouri, and Ohio Rivers, 1975--1991: Greensboro, N.C., Ciba Geigy Corporation. Technical Report 6-92, 69 p.
Canadian water quality guidelines for atrazine: Ottawa, Environment Canada Scientific Series no. 168, 106 p.
Canadian water quality guidelines for carbofuran: Ottawa, Environment Canada Scientific Series no. 169, 34 p.
Agricultural statistics: Washington, D.C., U.S. Government Printing Office, 551 p.
Agricultural resources---Inputs situation and outlook: Economic Research Service publication AR-25, February 1992, 66 p.
Census of agriculture data, final county file (machine readable data): Washington, D.C., Bureau of the Census. Drinking water regulations and health advisories: U.S. Environmental Protection Agency, Office of Water, 11 p.
Developing Canadian water quality pesticide guidelines for the protection of aquatic life: Water Pollution Control Research Journal of Canada, v. 23, no. 4, p. 500--509.